Graphic design is like the entryway to your house—it is instantly visible and makes an immediate impression…good, bad, or otherwise. For more than a decade, At Brand’s designers have been delivering creative concepts that are consistent to the personality of the companies we serve while still striking a chord with the audiences they want to reach. Whether it’s the creation or updating of a logo, developing design standards to ensure consistency of usage, websites, print advertisements, or large format graphics such as posters, banner stands, and trade show exhibits, we design for impact. Equally important, At Brand provides you with clean, print-ready files. 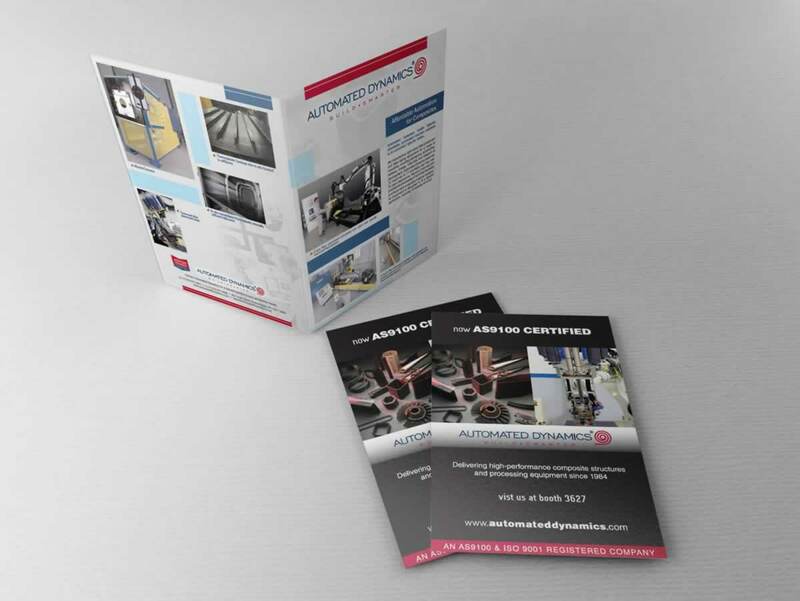 Our designers have worked in a range of industries and produce materials for a wide range of media. So whether you need an ad sized for a digital banner, Google AdWords, trade publication, or for a large island exhibit, you will receive production-ready art files that will save you time, headaches, and possible money. Not sure what to make of the art guidelines advertisers and production departments are sending you? No problem. Your account representative will make sure your project gets delivered on time, on budget, and according to the required specifications. When the marketing team of Automated Dynamics approached our creative team they had one requirement: create print ads that were more reflective of their status as a leading innovator in the field of manufacturing advanced composite structures and high performance composite processing equipment. Our approach was a shift in thinking. We wanted impact and recommended a shift from focusing on people to highlighting products. We also introduced bold pops of color, as opposed to the very neutral tan they had used in previous ads, and simplified the message. Whereas previous ads contained large blocks of highly technical content, we steered Automated Dynamics toward focusing on key messages, displayed in a bold and modern type, to create a dramatic effect that would draw the audiences eye. Internally, the ads were met with mixed reviews. Some of the company’s executives felt the new ads were too much of a departure from the previous look. We thought that meant back to the drawing board and toning it down a little. But the team trusted our vision and, externally, the new look was praised by clients, competitors, and editors. We were subsequently tasked with working with Automated Dynamics to create banner stands, trade show graphics, and other marketing materials.